An 18-year-old student from Lynbrook High School in California, made a technological discovery that has the potential to change the future of how we use your cell phones and many other devices creating an electrochemical supercapacitor that can charge our mobile devices in seconds rather than hours. Currently cells phones typically take several hours to charge. Electric cars are held back even further by the constant need to charge them for many hours after each day, not to mention the fact that there is no easy way to recharge them at gas stations due to the time it takes. However all of this could change if Eesha Khare – an 18-year-old student from California will have her way. Khare made a breakthrough by creating a small supercapacitor that can fit inside a standard cell phone battery and enable ultra-fast electricity transfer and storage, delivering a full charge in as little as 20-30 seconds. Khare was apparently frustrated with the short life of her cellphone battery and wanted to do something to tackle this problem so she turned to science and under the supervision of Dr. Yat Li at the Department of Chemistry and Biochemistry at the University of California, Santa Cruz she created a solid-state device with a hydrogenated TiO2 (H-TiO2) core that was able to power a LED light and during testing only lost 32.5% over 10,000 charging cycles. According to Khare the device is also flexible, so it can be used in roll-up displays and clothing and fabric having many advantages over batteries in that sense. Despite the tiny size of the prototype built by Khare, she is convinced she can scale it up for use in anything from cell-phone batteries to electric car batteries and even batteries for storing wind and solar power. 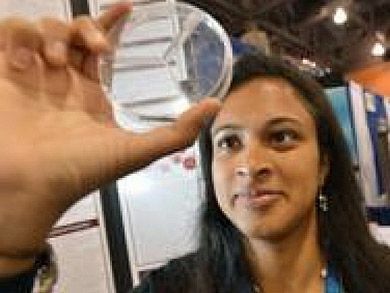 Khares’ breakthrough research made her win one of two Intel Young Scientist Awards, and $50,000 prize which she plans to put into good use financing her future education at Harvard. More information on Khare and the rest of the Intel Young Scientist Award winners for 2013 can be found on Intel’s website.